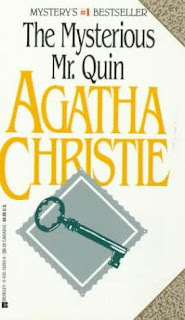 Agatha Christie is more than the most popular mystery writer of all time. In a career that spans over half a century, her name is synonymous with brilliant deception, ingenious puzzles, and the surprise denouement. By virtually inventing the modern mystery novel she has earned her title as the Queen of Crime. Curious? Then you're invited to read...THE MYSTERIOUS MR. QUINA conjurer of skill with an instinct for detection, Mr. Harley Quin has an almost magical flair for appearing at the scene of the most remarkable crimes. But is it just a trick of light that haunts his shadow with a ghostly apparition? Is it fate that invites him to a New Year's Eve murder? And what forces are at work when his car breaks down outside Royston Hall, an isolated estate with a deadly history? With fantastic intrigue, uncanny procedure, and Agatha Christie's most charismatic creation, these dazzling stories remain personal favorites for the queen of crime.AUTHORBIO: AGATHA CHRISTIE is the world's best known mystery writer. Her books have sold over a billion copies in the English language and another billion in 44 foreign languages. She is the most widely published author of all time in any language, outsold only by the Bible and Shakespeare. Her writing career spanned more than half a century, during which she wrote 80 novels and short story collections, as well as 14 plays, one of which, The Mousetrap, is the longest-running play in history. Two of the characters she created, the brilliant little Belgian Hercule Poirot and the irrepressible and relentless Miss Marple, went on to become world-famous detectives. Both have been widely dramatized in feature films and made-for-TV movies.Agatha Christie also wrote under the pseudonym Mary Westmacott. As well, she wrote four non-fiction books including an autobiography and an entertaining account of the many expeditions she shared with her archaeologist husband, Sir Max Mallowan. Agatha Christie died in 1976.